9 days to go – and news of the Velodrome ride and Invention Convention! Of the many rides we’re running from the Rally, one is especially unusual! Jointly organised by Sustrans and the Invention Convention, it takes participants over to York’s new Sports Village, with its Olympic-standard outdoor velodrome. A world exclusive! A fabulous all-comers freestyle session on York’s Olympic Velodrome. All bikes, handcycles, trikes, velocars, recumbents, cargo bikes and HPVs are welcome. We’re aiming to get the widest variety of bikes ever seen together on a velodrome. Most velodromes only allow fixies to ride, but York Sport have agreed to let us try all sorts of bikes on their brand new track! Whatever machine you pedal, come and have a go; if our Marshals agree you and youer your bike are safe, its off you go… BHPC members get the first hour to show off their machines, and from then it’ll be organised mayhem! 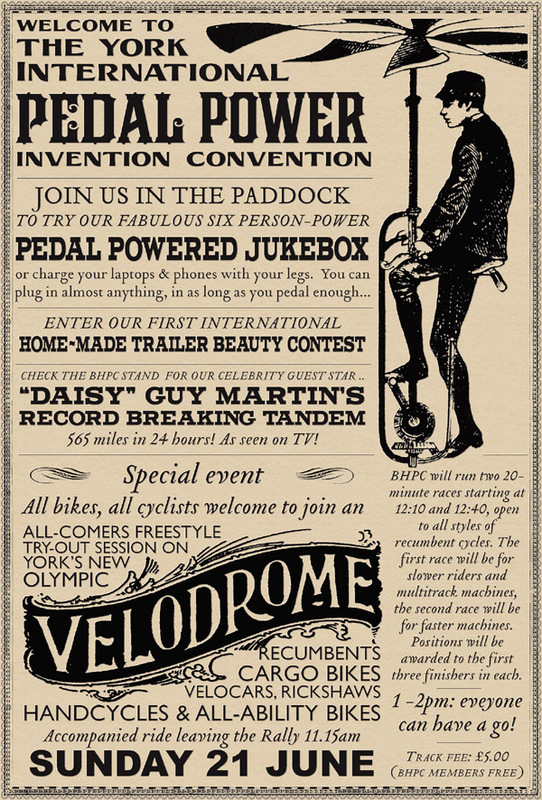 We want to see all bikes on the velodrome, from penny farthings to BMX, from unicycles to faired hpvs. There is a £5 fee to ride on the velodrome (free to BHPC members), payable in cash on the day. Free to watch! ‘Daisy’, the 24-hour record breaking tandem as seen on Channel 4’s ‘Speed with Guy Martin’. It’ll be on the BHPC stand. Visiting the Rally? Be sure to take a look! We’ve also decided to run a photo competition at the Rally with some great prizes – details follow in a moment in a separate post. Finally for now, we have confirmed talks for the Rally! Dave Barter will be telling us about the Billie Fleming Tribute Ride and the remarkable lady who inspired it! 2PM on Sunday in the talks area of the Lounge Marquee. There are now just three weeks to go until the Rally! So things are hotting up. We’re delighted that campsite bookings are already ahead of some previous years (in numbers of pitches booked, and campers attending). Trade bookings are also up on expectations so, while we’re not quite yet completely ‘in the black’, we’re very confident that the finances are looking good. So far we’ve raised about £14,000 of the approximately £18,000 budget for the 2015 Rally – many thanks to everyone who has booked a pitch, ordered clothing or become a Friend of the York Rally to help us achieve this. ‘On the day’ campsite bookings, sales of badges and show programmes, clothing, Friends memberships and other items will, we’re pretty confident, close the final gap. But as many expenses have to be paid in advance, please do take advantage of the final few days to book a campsite pitch at reduce rates, if you haven’t already! It’s cheaper than on the day, and on arrival you’ll be fast-tracked past the queues of those who haven’t yet booked. Reduced price bookings close at midnight this Monday (1st June) and all online advance bookings on Monday 15th June! An all age worship service with a Father’s Day theme will take place at St Matthew’s, Naburn, at 9.30a.m. If people want to meet to ride to the church we’ll leave the Knavesmire at 8.45 using the route via the Cycle Way. There will be a marshalled ride back after the service. The ride over to the church is almost entirely traffic free, on the old railway path, with just a few hundred yards of 20 mph road at the end. We’ll have a map on the website shortly, and probably paper copies to hand out (most of the route is shared with several other rides). Paperwork! Risk assessments, insurance, event manuals, fire plans etc etc are all soaking up time, with the brunt being borne by our Rally Co-ordinator Paul Reid. A huge thanks to him from us all for taking this on. The show programme! This will be compiled in the next week or so and sent to print in good time for delivery before the Rally. Site layout. A slight spanner in the works has arisen rather late in the day: a key area of the Knavesmire several football pitches in size has been declared ‘out of bounds’ for us to use: it was levelled and re-seeded relatively recently and is not yet fully established, and it’s to be fenced off. We were intending that space to be used for the grasstrack arena; this has now been moved down towards the Racecourse stands, with trade show and catering alongside it. It’s now a less than ideal layout – but a workable one we hope. Unfortunately there’s no getting around this, but we’re pretty sure it’ll be for this year only. Finally, just a note that though we’re working to make this Rally the best we can, please don’t expect it to rival past Rallies when the event was at its peak: we just don’t have the money to do that. As we work to revive the Rally from scratch, we’re staging this first Rally on about a third of the budget it had in the years before its cancellation. Despite everything being done by volunteers, and no expenses being claimed by anyone including committee members, we just don’t have the funds to do things like pay for advertising the event, having more marquees than absolutely necessary, or ‘buying in’ extra attractions. We hope it’ll be a grand weekend of cycling nonetheless, and we’ll rely on you, the visitors, volunteers and Friends to make it a great get-together even if it’s not as big-budget as it could be… And we’re very much hoping that this year’s Rally will leave us in a strong position to make it bigger and better in 2016! Thanks to everyone who turned up for our May meeting earlier today! special thanks to Sustrans for organising many family friendly rides. See here for the full list. We’re up to 14 confirmed exhibitors, with more in the pipeline! All are now listed on the website with logos and links. Many thanks to all of these companies for their support. We now have a dedicated mobile phone number for the Rally – this will be manned throughout the event so please use it if you have any queries on the day, or indeed before. successful, but the feedback we received will be very useful if we apply again in future years. Badges have been ordered, and as soon as stocks arrive they will be available on the merchandise page. A big thanks to Lancashire Cycle Link, the Facebook group, who have kindly promoted the Rally several times now to their thousands of members. We have a variety of updated posters, cards etc. for you to download and print on the downloads page. All help spreading the word is much appreciated! Advance campsite bookings end 1st June! Book in advance to get reduced prices, and to use the fast-track queue when you arrive! 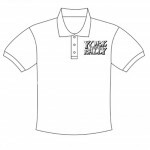 Any orders for York Rally clothing which you would like to pick up at the Rally most also be ordered by the 1st June! Volunteers can order at cost price – but the same deadline applies! Any company or organisation wishing to advertise in the show programme should contact our Trade Co-ordinator ASAP, because the deadline for including ad copy is also the 1st June 2015. Our next meeting is a final, on-site meeting. So we will be meeting on the Knavesmire at the lock-up (near the toilets at the end of Ebor Way) at 10 AM on the 6th June. All are welcome! 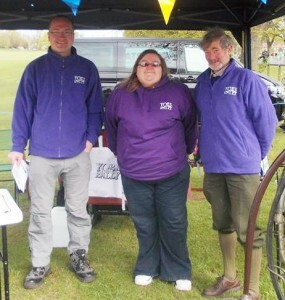 Some of the 2015 Committee modelling Rally clothing at our Tour de Yorkshire stand in May. Photo by Darren Sables. Click the picture to order clothing! We’ve been busy planning, processing bookings, dealing with trade stands, security, showers, talking with the council and more… and the Rally is now just a few months off! Earlybird campsite bookings ended a few days ago now, but until the 1st June you can still save (and get in quicker via the fast-track desk) by pre-booking on the campsite. For the latest update, come to our next meeting on April 11th! As usual it will be downstairs at ‘York Bike Shed’, Micklegate, York at 10 AM. We are looking at quieter venues, and the options for future meetings will be presented at this one. But for now, it’s back to the Bike Shed! Finally, we’ve been busy spreading the word about the Rally and September’s Sportive. Here’s a round-up: thanks to everyone for the coverage! 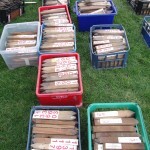 Audax UK have set up two traditional runs to the Rally, both on Friday the 19th June. There’s an ‘Arrow’ (for small groups) and a ‘Dart’ (for solo riders, also for Saturday) both of which can start anywhere at all, but must end on the Knavesmire. Atomic-Zombie Extreme-Machines from Canada, who are at the centre of a world-wide community of DIY bike builders, featured the Invention Convention in their newsletter! Walsall Area CTC gave us this mention! 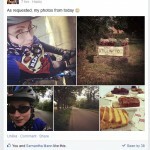 Leeds Cycling Campaign are organising a ride to the Rally! 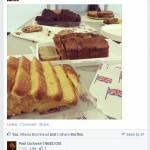 Leicester Spokes gave us a nice mention and have plans for a group attendance! And finally to the ever helpful i Travel York team at City of York Council for including the Rally on this brochure. Has anyone seen any more? Let me know and I’ll add them! Or if you think there’s somewhere the Rally or Sportive should be listed, but they aren’t there, please let me know. – Farewell to two stalwarts of York Rally volunteering: Geoff Warnes and Sandra Thompson both recently passed away. The meeting paused to remember with gratitude the many years of tireless service which they contributed to the York Rally. – Popular folk band The Foresters (see http://tinyurl.com/ljv6ptj ) have been booked for evening entertainment on the Saturday night. – A reminder that earlybird prices for the campsite close in just a few weeks, on the 6th April. Book now for reduced prices! – Our next meeting will be on the 11th April 2015. Much more was discussed too of course – more later! Order your York Rally clothing now! 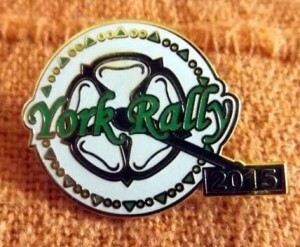 Just a note that the York Rally Merchandise page is now live! 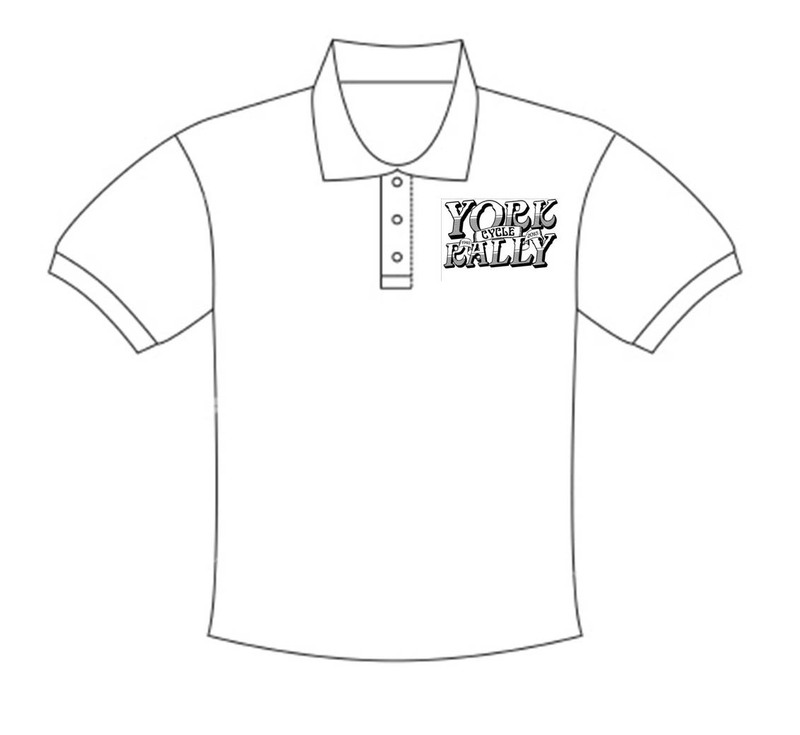 There’s both online ordering and a ‘print out and send in by post’ order form, to order T-shirts, polo shirts, sweatshirts, hoodies and full zip fleeces printed or embroidered with the 2015 York Rally logo. There are three colours, and a range of sizes in men’s, women’s and children’s styles. You can either have items posted or pick them up at the Rally. We’ll only have a few demo samples at the event itself, so ordering is essential! Of course you will also be able to order items at the Rally for delivery afterwards by post. 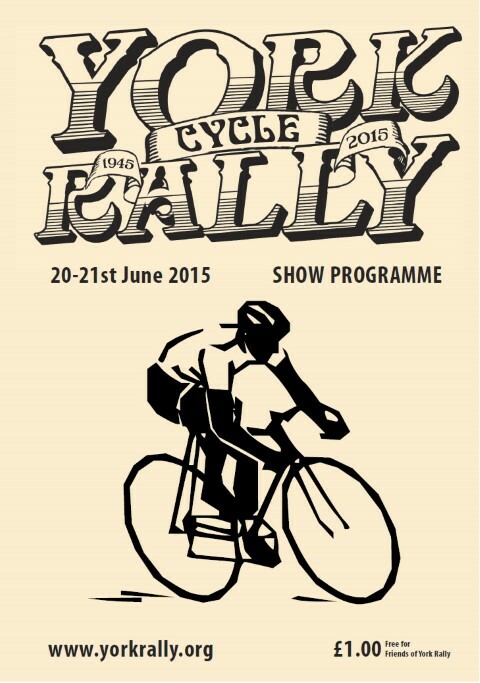 Cut-off date for orders for collection at the Rally is the 1st June 2015. Go to the York Rally Merchandise page to see the full range and place an order! Any money made from merchandise sales will help fund the revival of the York Rally, and as you wear your Rally clothing with pride you’ll be helping to spread the word about the event, too! 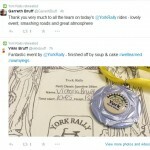 The York Rally Sportive rides again: 20th September 2015! 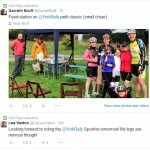 Following last year’s successful fundraising Sportive, the York Rally is organising a repeat event this year, on the 20th September 2015. The three routes (36 km, 100 km & 140 km, about 22, 62 & 86 miles respectively) are as last year, possibly with just minor changes. 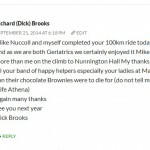 As last year, the routes will start from Wigginton Village Hall just north of York, and the longer rides will head up into the spectacular North York Moors, while the shorter ride stays to the mostly flat countryside below the Howardian Hills. 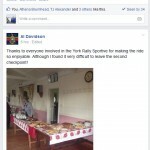 The organisers have a long list of improvements to put in place after last year’s Sportive, the first we’d run. 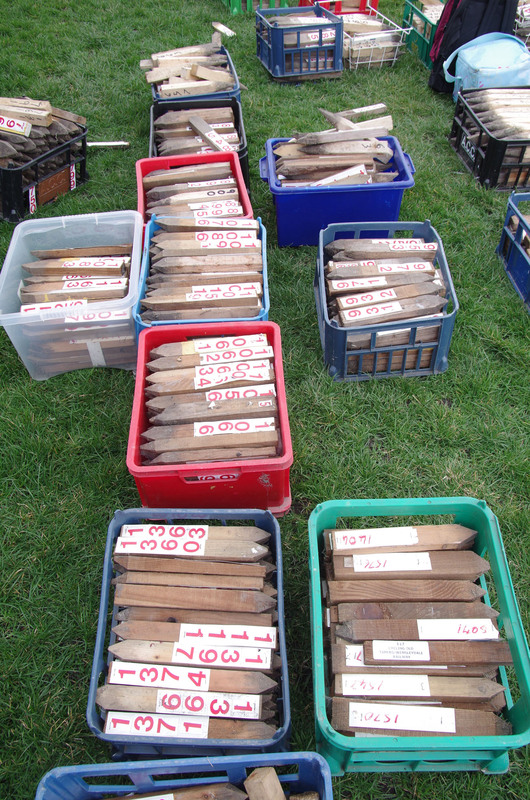 This will include clearly identifiable signs (and even more of them!) and also completely accurate GPX routes: these will be added to this page for you to download as soon as they’re finalised. Read all about this year’s Sportive and enter online now! 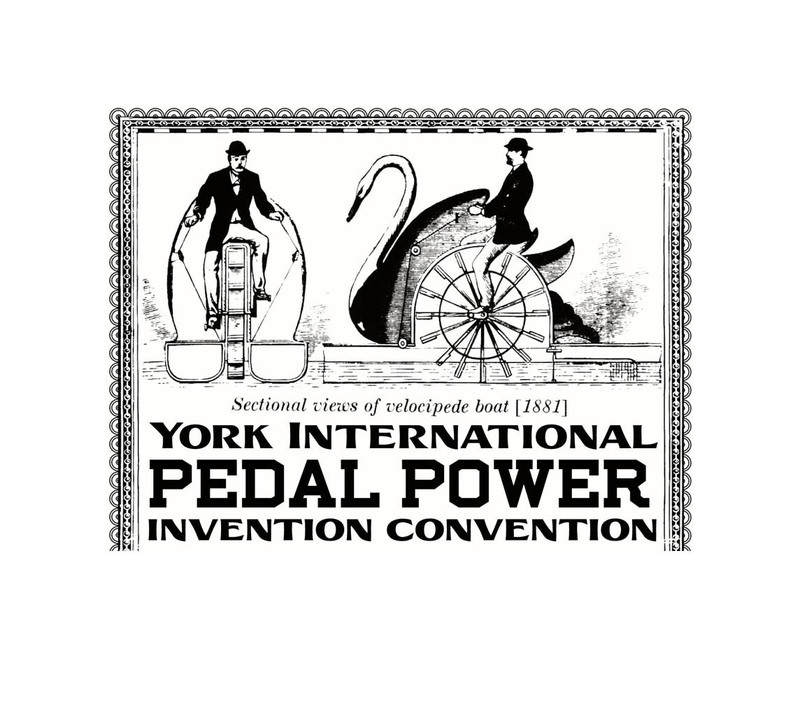 Announcing a major new attraction for the York Rally – the Pedal Power Invention Convention! We’re proud to announce a major new attraction for the Rally, the wonderful Pedal Power Invention Convention! Gloriously mad, superbly practical, massive fun: pedal powered inventions and devices can be any of those! They’re also almost irresistable to pedallers of all ages: everyone wants a go. We’re bringing all of this excitement, plus the geeky satisfaction of hacker, off grid and DIY engineering culture, to the Rally this year! Organised by a local artist, the Pedal Power Invention Convention will bring new life, sights and sounds (pedal powered naturally) to the Knavesmire. 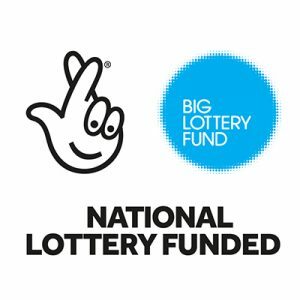 Subject to Lottery funding, it’ll also go into schools and colleges in the weeks and months before the Rally, inspiring design-and-build activity to spark young minds – and to bring the results together at the Convention for a pedal-powered celebration! The more serious aspect of the Invention Convention is all about how bikes beyond the diamond frame can be seriously useful. So cargo bikes can transport the Rally’s rubbish. Recumbent trikes can extend a touring life when balance is difficult. Family cycles can transport children to school in safety and comfort. And a pedal generator or tool could be a huge labour saver off-grid – or even a life-saver where mains power is not available. 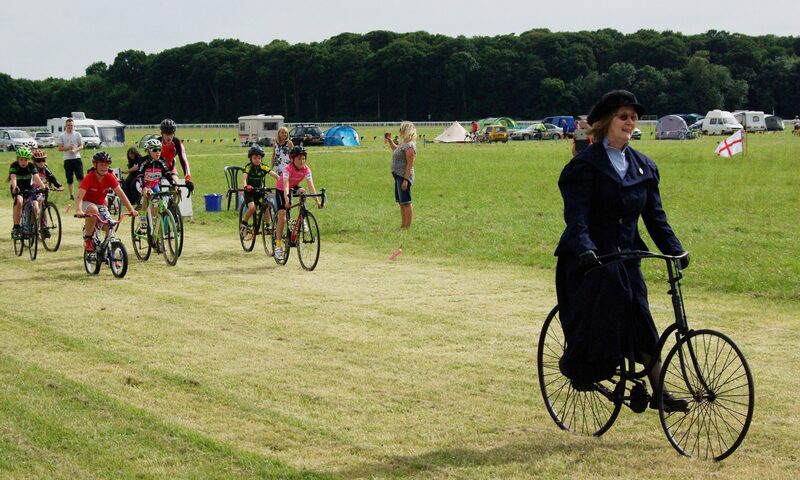 This promises to be the biggest and best gathering of unusual cycles, pedal powered machines, human powered sound systems and cinemas, DIY recumbents, custom cycle choppers and artbikes the UK has ever seen. We don’t yet know how big it will be – but we have the whole of the huge Knavesmire to host it, and the more the merrier! If you’re coming, check out the main Invention Convention page and do drop a note about what you’re bringing, there or below. If you’re camping, you’ll need to book a pitch and mention the Convention as the group you’d like to be located with – there should be a fantastic campsite atmosphere, with cycling chat all the way through to 11PM, when all needs to be quiet so that tired pedallers can get their sleep! This form is no longer active. Rides updated, auction is back! The Auction Sale is back! Still a few logistical details to be finalised, but the basic format is back for the Saturday of the Rally. See what you can make from that bike or part you no longer need – you might be surprised! Details here.